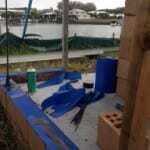 We installed a Homeguard termite barrier system for a new home under construction in Coomera Waters this week. The home owner was aware of the damage that termites can cause (an incredible $780 million around Australia each year!) and wasn’t prepared to take the chance. The odds aren’t in your favour. 33% of homes on the Gold Coast WILL at some point experience the presence of termites. Call Luke Taylor today and find out how The Pest Company can protect your home.